Web printing could be quite troublesome especially when the actual contents are only occupying a small portion of the printout while the rest are just those advertisements, images, empty spaces and other junk. It is not only wasting paper, ink and more importantly, it is not environmental friendly and that is how this useful utility can help here. Named as PrintWhatYouLike, it is a free online editor that able to let you format the web page and only print on what you like to see in simple steps. 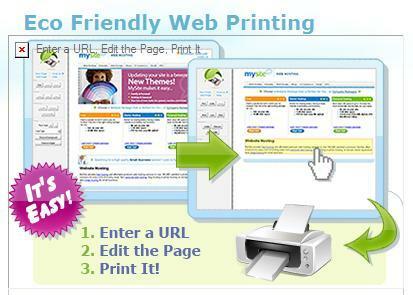 PrintWhatYouLike doesn’t require you to download and install any component since everything will run on web browser. First, just go to PrintWhatYouLike homepage, then enter a web page URL and it will bring you to the web page which includes PrintWhatYouLike editor. Alternatively, in order to make it accessible at anytime at any web pages, you can add PrintWhatYouLike bookmarklet into your web browser so that you can include PrintWhatYouLike editor at a web page with just a single click. Once you have done that, you should be able to see a PrintWhatYouLike button appears on the bookmarks toolbar at the top of browser. When you want to print a web page, just click on PrintWhatYouLike button and the editor will be appeared on the left. You can use this editor to format the web page like remove advertisements, resize web page content, change font size and type, remove images and background. If you would like to consolidate all of information from multiple web pages, it even allows you to combine multiple web pages with different URL under one document before printing. Besides, you can convert the formatted web pages to PDF or HTML document so that it can be attached as softcopy in the email and sent to your friends. PrintWhatYouLike is absolutely free to use and it is supportable to run on Firefox, IE7+, Safari, Chrome and Opera. As a little effort to save our trees, go and start using PrintWhatYouLike today.